Researchers traced some cases of a rare pediatric leukemia to a genetic fusion that brings together the front end of CBFA2T3, a blood protein, and the back of GLIS2, a protein that is normally produced only in the kidney. The error switches on genes that drive immature blood cells to keep dividing, leading to leukemia. Investigators traced the genetic misstep to the rearrangement of chromosome 16, which brings together pieces of two genes and sets the stage for production of an abnormal protein. 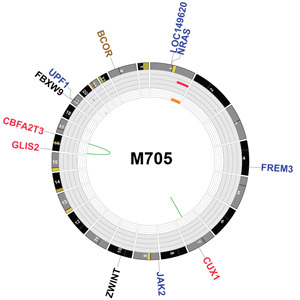 The fusion protein features the front end of CBFA2T3, a blood protein, and the back of GLIS2, a protein that is normally produced only in the kidney. Research that appears Nov. 13 in the journal Cancer Cell shows that in a variety of laboratory models the CBFA2T3-GLIS2 protein switched on genes that drive immature blood cells to keep dividing long after normal cells had died. This alteration directly contributes to leukemia. “The discovery of the CBFA2T3-GLIS2 fusion gene in a subset of patients with AMKL paves the way for improved diagnostic testing, better risk stratification to help guide treatment and more effective therapeutic interventions for this aggressive childhood cancer,” said James Downing, M.D., St. Jude scientific director and the paper’s corresponding author. “We focused on AMKL because no one had any idea of what caused this leukemia in most patients,” said first author Tanja Gruber, MD, PhD, an assistant member of the St. Jude Department of Oncology. The study excluded AMKL patients who were infants or children with Down syndrome because earlier research had linked their disease to other chromosomal rearrangements. “Whole-genome sequencing has allowed us to detect alterations in cancer cells that were previously unknown. Many of these changes contribute directly to the development of cancer,” Gruber said. Gruber TA et al. An Inv(16)(p13.3q24.3)-Encoded CBFA2T3-GLIS2 Fusion Protein Defines an Aggressive Subtype of Pediatric Acute Megakaryoblastic Leukemia. Cancer Cell. Nov. 13, 2012.